ESI coverage: Extension, to On-site Construction Workers ! It is reported that “the labour ministry will soon extend its medical coverage benefits to on-site construction workers, a step in the direction to provide social security to a huge section of the unorganised workers”. Extending the ESI security-net wider is appreciable indeed. But, when the Government itself agrees that the On-site construction workers are unorganised workers, it must move forward cautiously. It must keep in view the points discussed during the numerous tripartite talks in the Seventies, Eighties and Nineties. The records in this regard must be available in the Hqrs. Summary of those facts had been recorded in the Annual Standard Notes also upto the year 2000. It must ensure proper actuarial calculations, especially when the ESIC does not have its own Actuary with the real knowledge about the working of the organisation. It is very essential. ESI Act is essentially for organised workforce, in spite of the term “otherwise” in Sec. 1 (4). Payment of contributions, submission of returns, reporting accidents and many other formalities would show that the scheme is employer-centric. Yet, the ESIC could not extend the scheme to construction sector because of many practical considerations. That, precisely, was the reason for so many tripartite talks for decades. So, if necessary, a separate structure may be evolved the way it was done in the later nineties for cashew workers of Kerala. The scheme was, ultimately, discontinued by the ESIC. The documents that show why that scheme meant for cashew workers had been dispensed with may also be gone through, in the present context. Thereafter, let the authorities have some pilot projects regarding extension of ESI Coverage to the construction workers, experimented in one or two regions, one in the North (Rajastan) and another in the East(Bengal) or South(Andhra Pradesh). Let the experience gained be analysed before embarking on coverage nationwide. That will be a prudent, essential and reasonable precaution. Formulate a system in such a way that it does not allow malingering and false claims. The experience of the ESIC in respect of the TDB in Bihar and Gujarat must be taken into account with the seriousness it deserves.That will guide the authorities before venturing into the extension of the scheme to construction workers throughout the nation at the initial stage itself. Already, many construction agencies, undertaking Turn-key projects are abusing even the existing provisions, by covering the on-site construction workers, on the sly. The impact of such wrong coverage and the intention behind such voluntary coverage by the construction agencies must be studied with open mind and the facts that emerge out of such study must be accepted, before moving forward with such coverage. 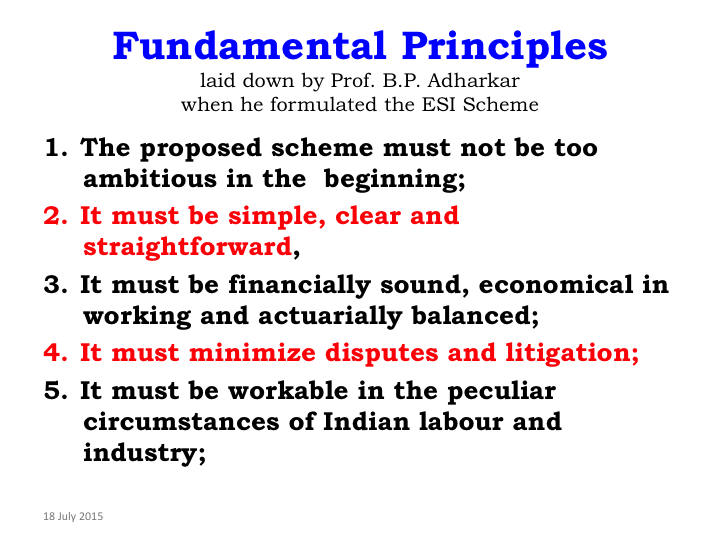 Prof Adharkar, the visionary, has rightly said that when a scheme is proposed it must be workable in the “peculiar circumstances of Indian labour and industry”. Sage words ! Already, inadequate knowledge coupled with over-enthusiasm on the part of the people who count has played havoc with the system in certain areas. The Medical College matter is one such case where the authorities do not know what to do next. Let not this proposal to extend the provisions to the on-site construction workers also result in chaos and meet the same fate. ESIC is not only meant for providing benefits to the deserving insured population. ESIC is also the custodian of funds contributed by honest workforce who believe that the funds would be used rightly, to provide benefits to the really needy. They believe that because the ESIC is a public organisation, it wold take every care to ensure that the funds are not misused by dishonest employers and employees in connivance with greedy consultants and covetous bureaucrats. Proposed scheme must be on practical lines and there must be proper, effective and unambiguous checks and balances. Nebulous law and procedure for settling the claims of such on-site construction workers would result in honest officers and staff shying away from handling the subject.